Straddle two counties before you straddle the bar stool to ring in 2017. All you can eat peat on this one, so bring gaiters if you got ’em! 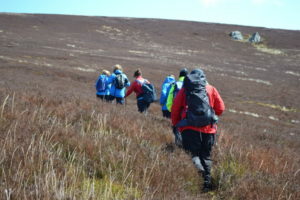 This walk includes Knocknagun (555m), and Glendoo (586m) on the Wicklow-Dublin border. Knocknagun (gaelic: Cloch na gCon meaning ‘the Rock of the Hounds’), a rocky outcrop (tor). Above photo by Judy Gough. Great views en route of Tibradden, Fairy Castle, Knockree Hill, Maulin, Tonduffs, Kippure, the Lough Brays, and ‘the Big Smoke’ (i.e. Dublin). Can do, will do, Glendoo (to Knocknagun)…and straddle two counties.